When I, like a lot of people, hear the word “pirate”, I immediately envisage a certain picture extremely vividly. The gentle ocean breeze wafting over the sparkling blue ocean. A creaky wooden vessel with a menacing Jolly Roger heading for the horizon, and on it, a wild band of rogues and buccaneers, splendid in their 17th century garb, gloating and quarreling over a casket full of cursed Aztec treasure. Of course, the monstrously successful Pirates of the Caribbean series have really influenced this imaginary scene from the costuming to the lighting. Yet it appears, that this week, the Game of Thrones franchise has been assailed by some rather real pirates (no, we are not talking Johnny Depp appearing in a fleeting cameo scene in all his dread-locked glory). And it also seems that the majority of those high seas (or rather, high Internet) rogues hail not from the storm-tossed Caribbean seas, but from the cozy and misty London town. The Daily Telegraph, that venerable bastion of middle-class “Britishness”, noted yesterday, with a certain wry amusement that all imaginable “piracy records” (now apparently such a thing also exists! 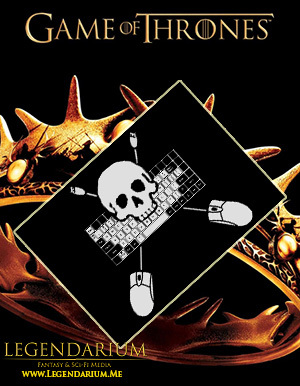 ), have been surpassed in the space of one single day immediately after the airing of the first Game of Thrones episode on HBO, as the clamoring die-hard fans made a beeline for downloading the premiered episode illegally, whilst presumably brandishing their cutlasses and telling their parrots to shut up. 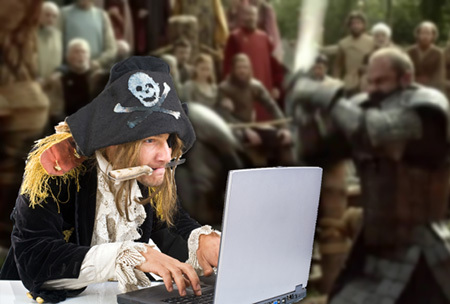 Quoting the data from a source aptly named TorrentFreak, the Daily Telegraph states that the number of people opting to see the coveted first episode of the new season was simply astronomical – just 52, 786 alone downloading the whole episode – now, this makes quite a lot of pirates indeed to populate the high seas! Of course, piracy is certainly not the thing to condone, or support. However, a lot of true Game of Thrones aficionados would definitely support the words of the show’s director David Petrarca: although by no means we should opt for illegal downloading, such sky-hitting, record-breaking statistics in downloads just 24 hours since the first episode aired, do tell us a lot about the popularity of the story in question, and how the plot-line manages to captivate so many people so much as to be so keen to see what happens next. One thing is certain: the new episode for any self-respecting Game of Thrones fan is exactly what a chest full of shiny golden doubloons was for Blackbeard the Pirate. You cannot really blame either for wanting it badly. About the Contributing Reporter: Olga A.
Hailing from the swirling mists of London, I am a freelance journalist in my free time, and a huge fan of J R Tolkien’s “Lord of the Rings,” as well as an admirer of the “Game of Thrones,” a worshiper of H P Lovecraft, a follower of R. Howard, a Star Wars aficionado and an Ursula Le Guin enthusiast. My other favourite things include Middle Eastern dance (sometimes somewhat discourteously referred to as “belly” dancing), Yoga, sunsets over the dreaming spires of Oxford and plush owls. Oh, and green tea too.